Hello from Japan – yes we chose to head east on the remainder of our trip. Initially our plans had us going back to Europe for the summer but after taking the flights to get this far East we decided to keep going. We found some good flights and . . . hello Japan!!! 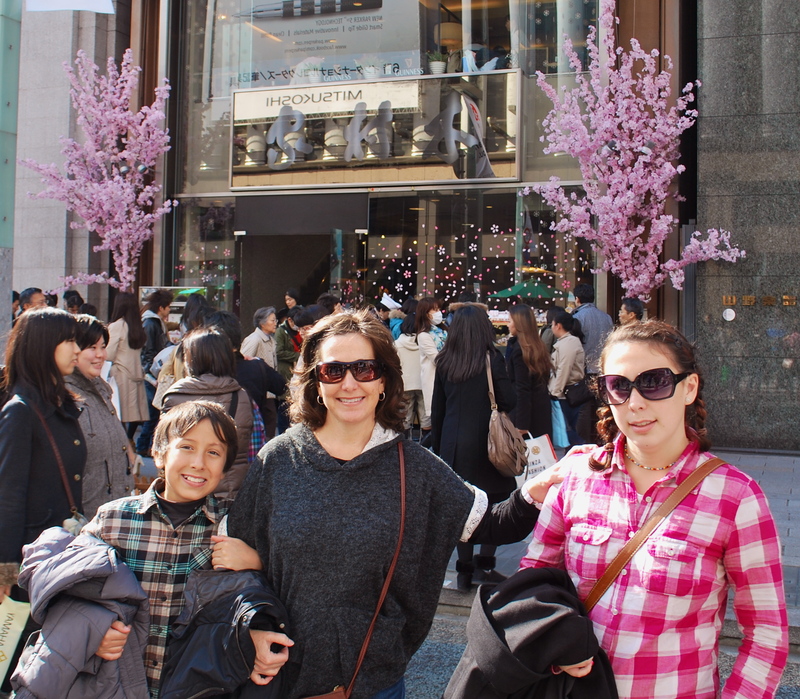 Here we are in the Ginza district - posing with the cherry blossoms we found. Japan has been a great stop for us. We purchased a Japan Rail Pass in Beijing — you have to buy it before you land in Japan to get the discounted price. The pass allows you to travel throughout Japan on their fabulous trains. 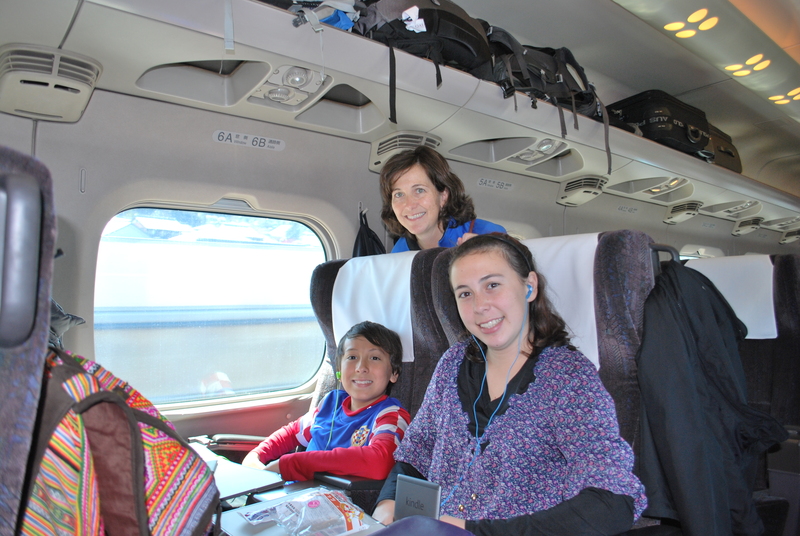 We took the Shinkansen bullet train from Osaka to Kyoto and 3 or 4 different trips with the pass. We felt like royalty riding on these trains. They were so comfortable and CLEAN!! Everything in Japan is so civilized and orderly. You rarely see people eating or drinking on the streets and we never saw litter anywhere (we had read that in a travel guide book and it’s true). If we saw smokers there were designated areas for that and people definitely obey the laws here. There are white lined squares painted on the sidewalk where smokers could stand and smoke together and yes, people stayed in the lines. Our first taste of the intense order here was walking across an extremely very busy street; you don’t jay-walk in Japan and cars obey the laws. People cross major intersections from five different directions with no fear of ever getting hit. They say Japan is one of the safest countries in the world and we definitely felt safe . . . people were also so eager to help you if you looked lost. Here comes the Shinkansen train. Enjoying our down time on the Shinkansen. After we landed in Osaka, we headed to Kyoto, which has a cute small town feel with a population of 1.5 million. We had hoped we could catch some early Cherry blossoms but it had been a cold spring there and it also rained most of our stay. Kyoto is known for it’s Geisha district of Gion and we had hoped to see some strolling about but since it was cold and rainy we didn’t see any. We did see various different women wearing the traditional dress (kimono’s) with the mat/backpack on their back and the special shoes. We had a great hostel in Kyoto, which is where we were able to start posting our blog after our time offline in China. After Kyoto we headed to Tokyo where the weather was much nicer, a bit cool but sunny and great weather to wander around in. We visited the Ginza district, which is full of high-end shops, everything you could imagine. Kendal wanted to pop in to the Abercrombie and Fitch store to see what’s new in teen fashion. As we entered the store there was a small line and we noticed people were getting their picture taken. It happened to be 2 male models showing their abs to all who entered the store and you could get your photo taken with them. Not one to miss the opportunity Kendal stood in line and had her photo taken. Kendal and her 2 favorite things about Japan. A highlight was our visit to Tokyo Central Wholesale Market (Tokyo Chuo Oroshiuri Ichiba) or better known as the Tsukiji market, which is located in the Tsukiji district. We took a visit to see the market as well as to have the finest, freshest sushi. The Tsukiji Market is the biggest wholesale fish and seafood market in the world! We learned so much in China and I would recommend to anyone to definitely visit China – but after being there for a month we were ready for someplace new and Japan hit the spot perfectly. 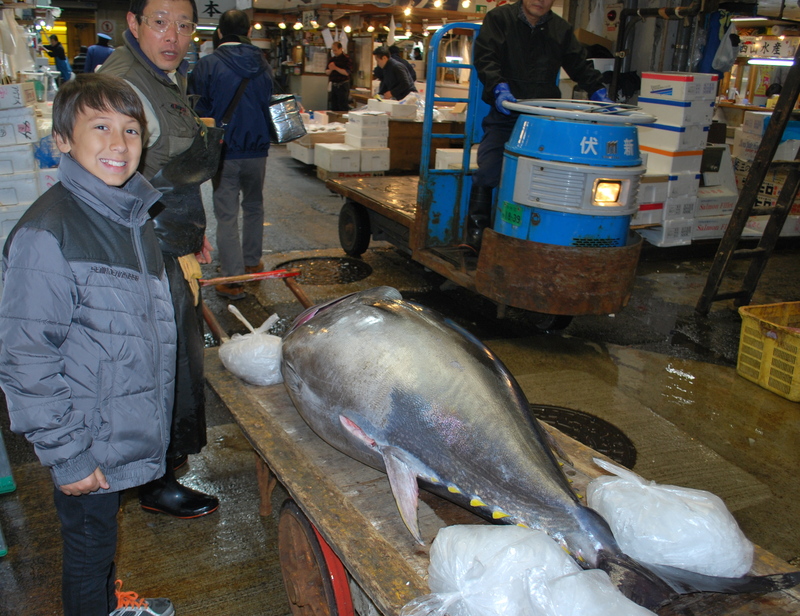 Keegan at Tsukiji market with a huge tuna fish that the man just brought in. Glad to hear you’re having some good train experiences now! It must be so different to be alble to cross busy streets without worrying about being hit. Too bad the US can’t be more like that! Have fun in Japan & I will look forward to hearing all about it!